The Rossica Society was born in Igalo, Yugoslavia on 14 April 1929. The brainchild of Eugene Arkhangelsky, a prominent aero-philatelist and philatelic author, its early adherents were mostly emigre White Russians who fled their country after the October 1917 coup and scattered to the four corners of the globe. The political, economic and military upheavals of the 20th century chased Rossica's center of gravity from Yugoslavia to the Baltic States and then to Shanghai, where the war in the Pacific prevented it from distributing its journal, and WWII wiped out much of its membership. The Society collapsed in early 1942 and took a decade to reconstitute itself, this time in the U.S., where it remains based to this day. The purpose of the society then, as now, was to encourage the apolitical study of Russian philately, postal history and allied collecting fields such as revenues, vignettes, scrip and picture postcards. 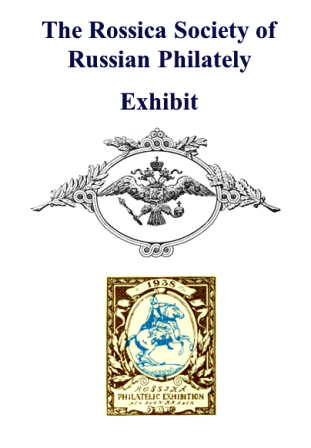 It does this by publishing the award-winning "Rossica Journal of Russian Philately" and a number of book-length translations and monographs, participating in exhibitions, and making its library - one of the two largest concentrated holdings of Russian and related-areas philatelic literature in the West - available to the membership. In its European and Chinese incarnations, it was primarily a society for Russians interested in philately; today it has become a society for people interested in Russian philately. Although knowledge of the Russian language is certainly an advantage, it is not a necessity; in fact, a majority of its 300+ members neither read nor speak Russian.